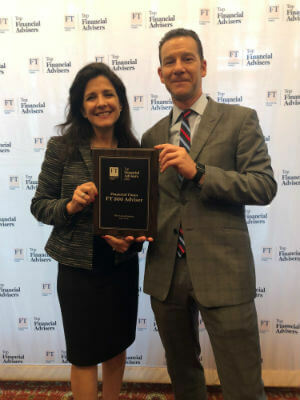 The Financial Times has once again named Aspiriant one of the Top 300 Financial Advisors of 2018. Aspiriant, which manages over $12 billion for individuals and families throughout the U.S., ranks among a prestigious roster of Registered Investment Advisers. Financial Times graded RIA firm applications on a set of criteria including assets under management, AUM growth rate, years of existence, compliance records and the advisor team’s advanced industry credentials. Aspiriant principals Lisa Colletti and Michael Weissman received the award on behalf of the company during a ceremony in New York City on June 28.